Jennie Hedrick, coordinator of the Peter M. and Paula Green Johnson Career Center, helps provide customized career services. Obtaining a good job tops the list of reasons to attend college for most students. 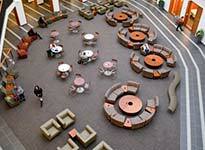 To meet this need, the Peter M. and Paula Green Johnson Career Center opened in 2008 to provide College of Business students with the right tools and connections. 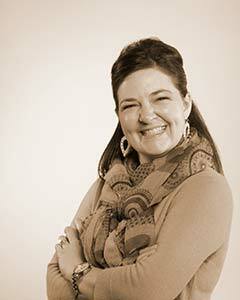 As coordinator of the center, Jennie Hedrick plays a key role. A passion for UW: Hedrick attended Casper College and then completed her bachelor’s degree in communication through the UW Outreach School. She loved the people-oriented field of communication and moved to Laramie to earn her master’s degree in communication. But she says she didn’t fully realize everything UW offers until she began working for the UW Admissions Office. There, Hedrick learned the extent of UW’s impressive state funding and low tuition compared to other universities, as well as the breadth of groundbreaking research and world-renowned faculty. The center also coordinates internships, which Hedrick says are extremely valuable for letting students test drive career options. Hedrick seeks to make connections with a diverse set of businesses—from large firms to small businesses and startups. The University of Wyoming Peter M. and Paula Green Johnson Career Center (JCC) is dedicated to assisting College of Business students with comprehensive career planning services which start at the beginning of a student's college journey.